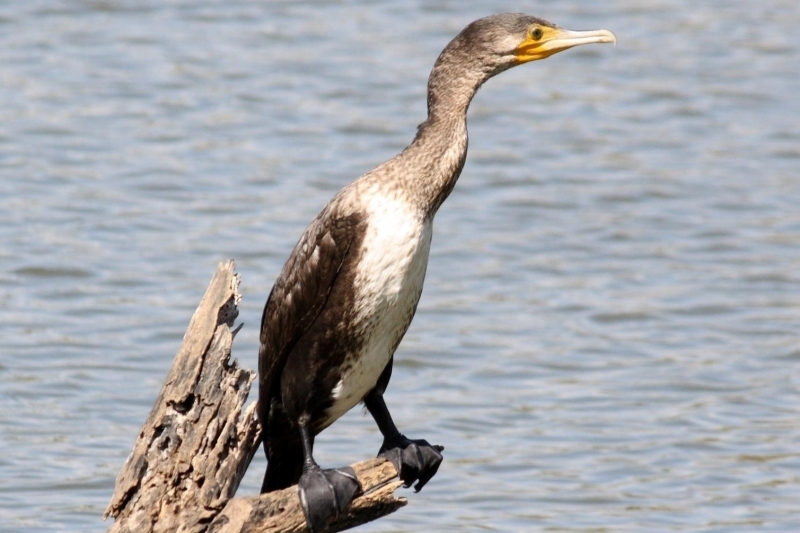 Cormorants are members of the pelican family with all 4 toes on each foot webbed, which helps them in swimming and chasing fish underwater. 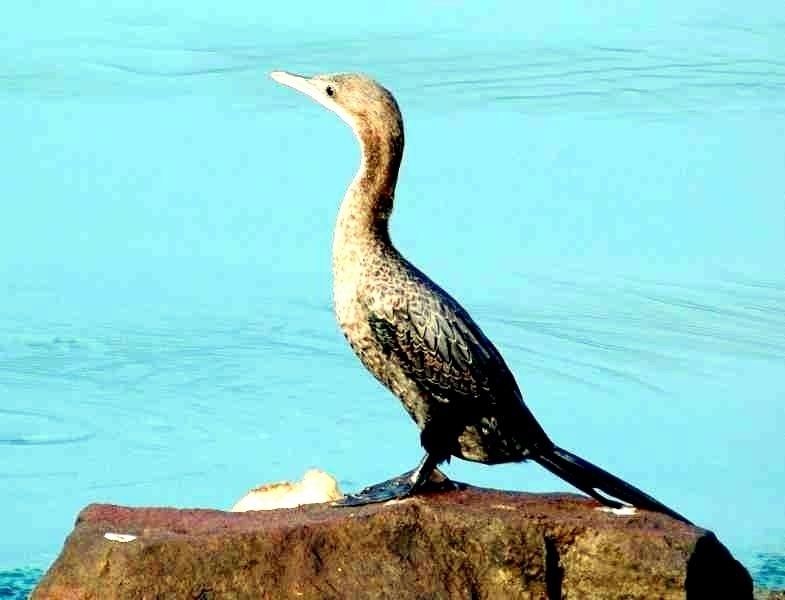 Cormorants are rarely found far out to sea, preferring to fish near to the coastline and perch on rocks, jetties, cliffs or trees. 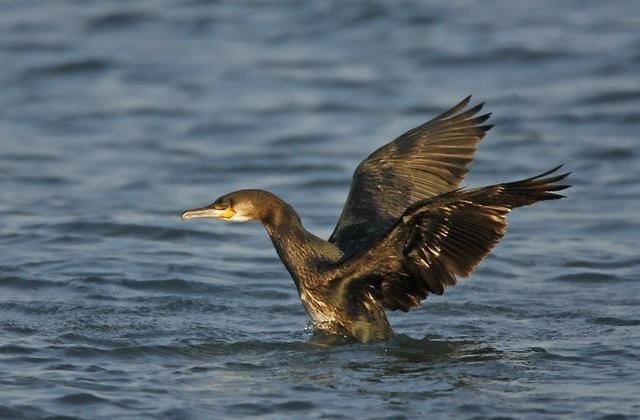 They often go out feeding together, flying in lines then settling on the water in a tight bunch. 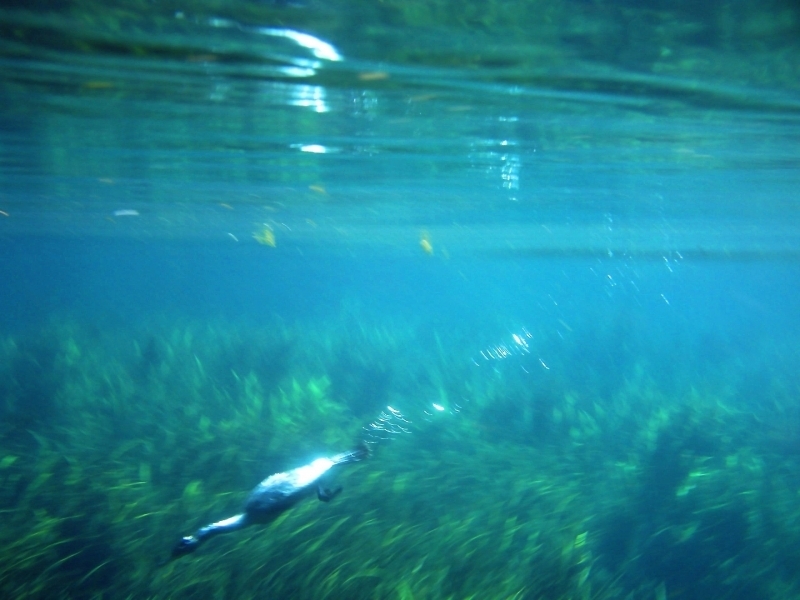 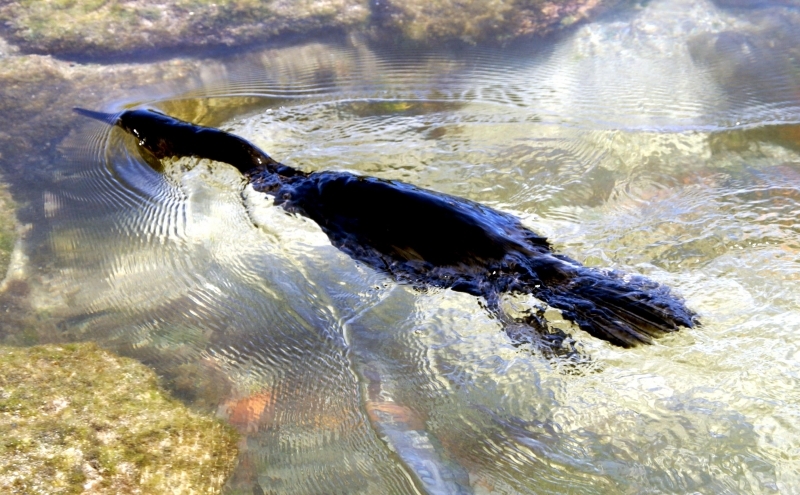 They swim around, ducking their heads beneath the surface to look for fish. 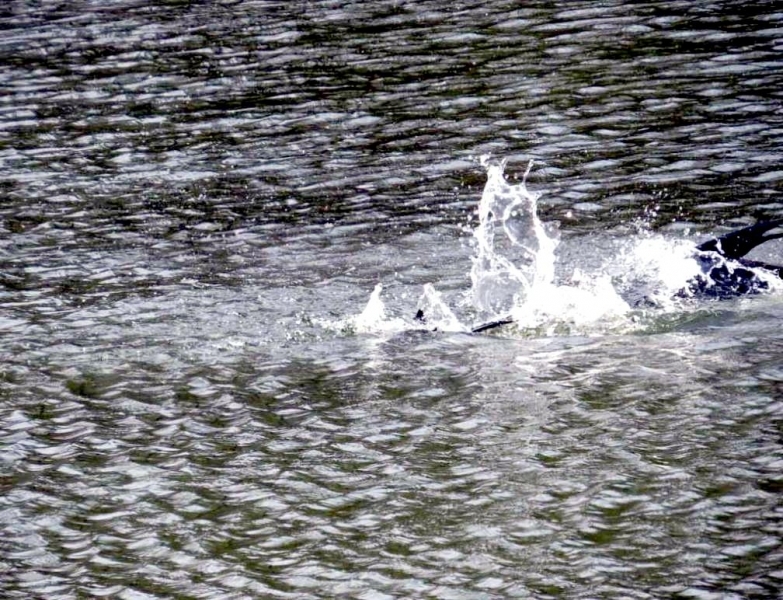 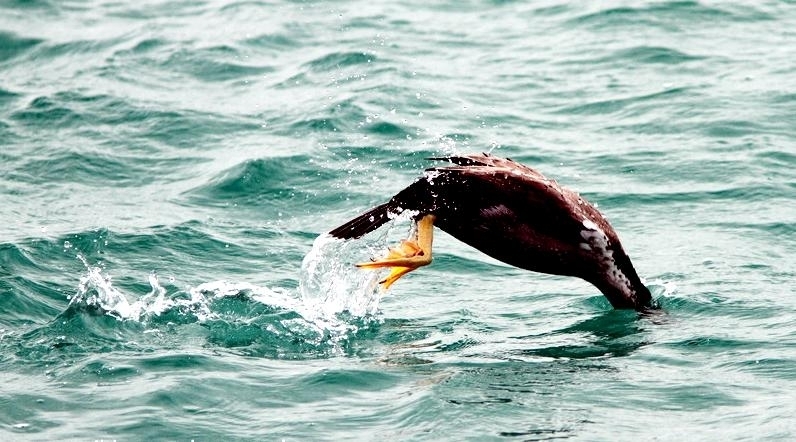 When one bird dives, the others follow it. 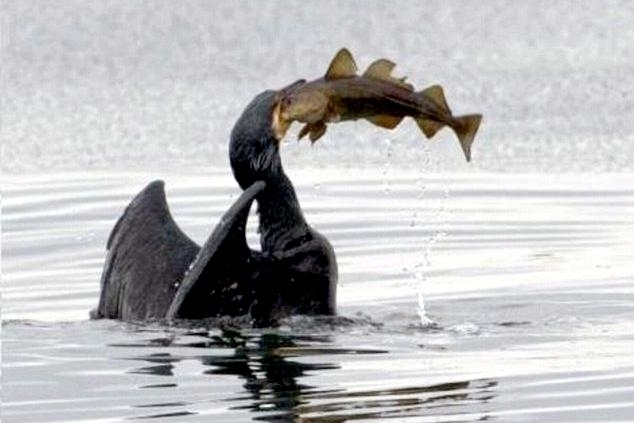 Fish are brought to the surface and swallowed head first. 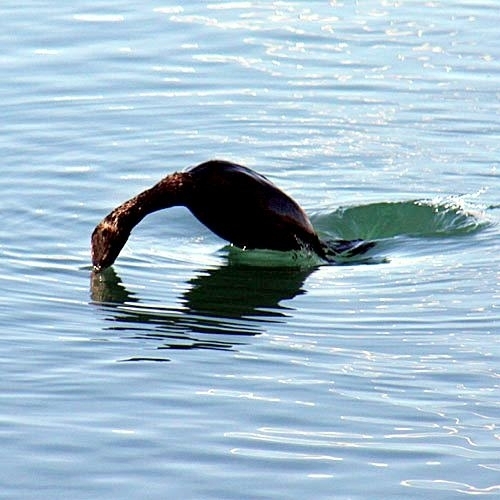 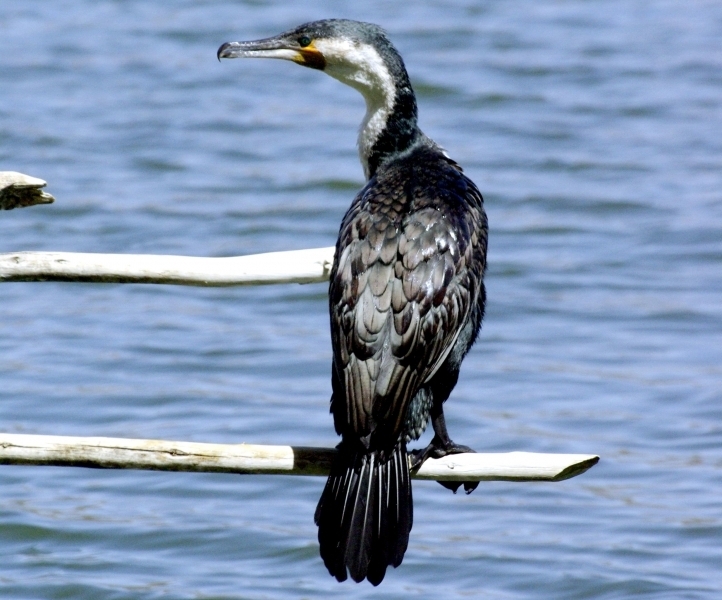 Cormorants are expert swimmers, floating low in the water, sometimes with only their head & neck showing. 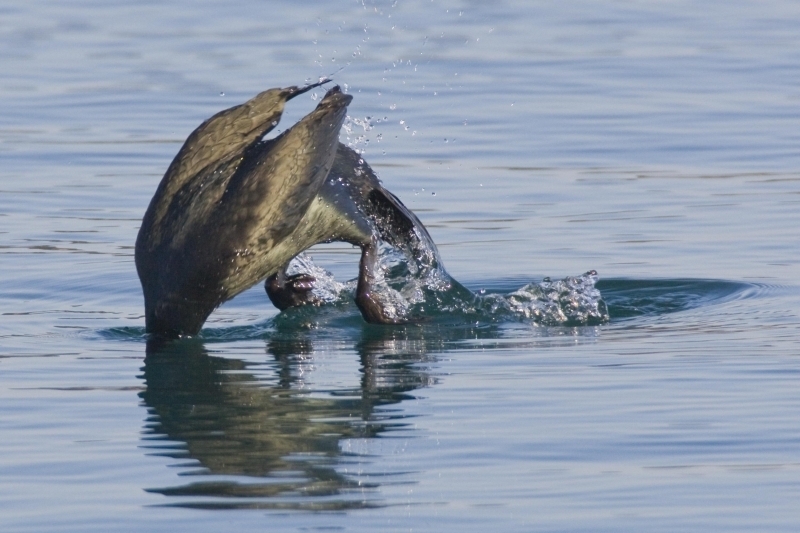 To dive, they jump up and plunge in head-first or just sink beneath the surface. 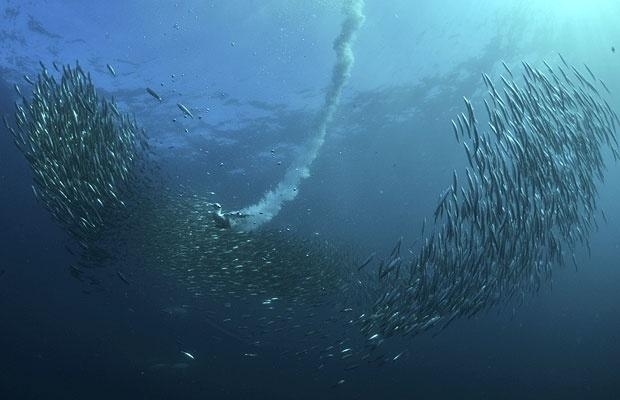 They may dive down as far as 100 feet and the longest recorded dive is of 71 seconds. 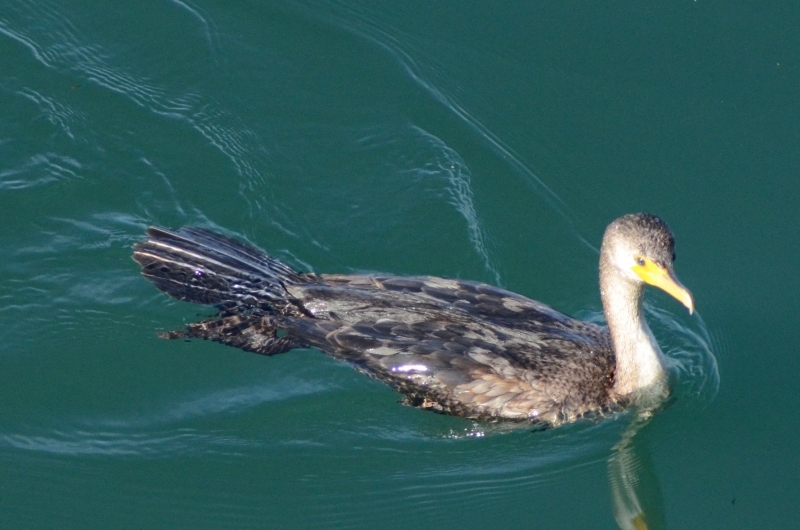 Usually they stay under for less than half a minute, swimming about 20-30 feet below the surface. 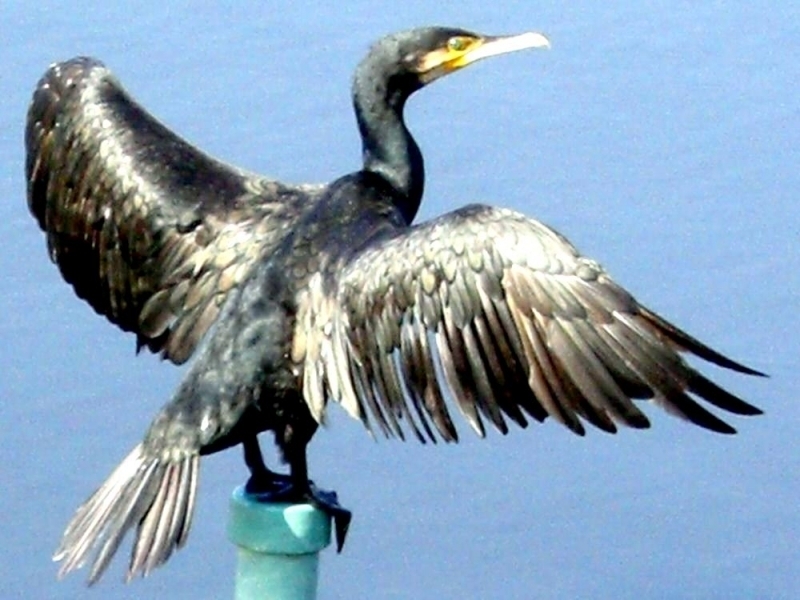 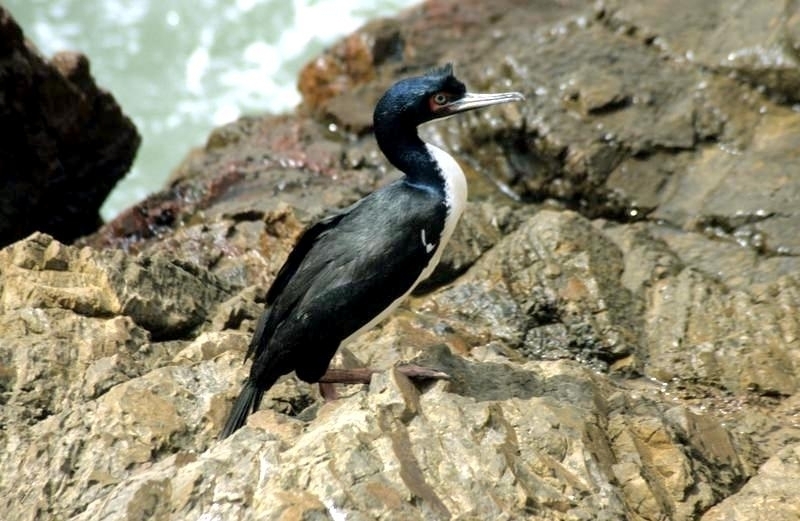 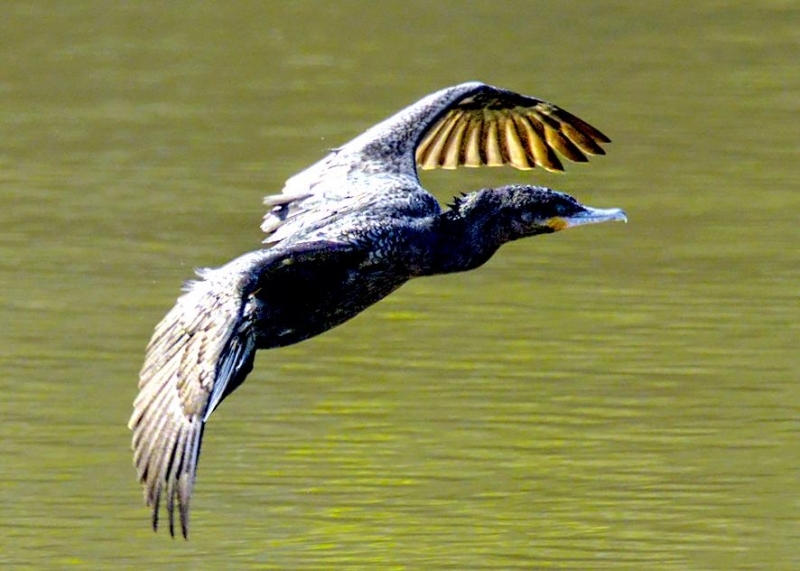 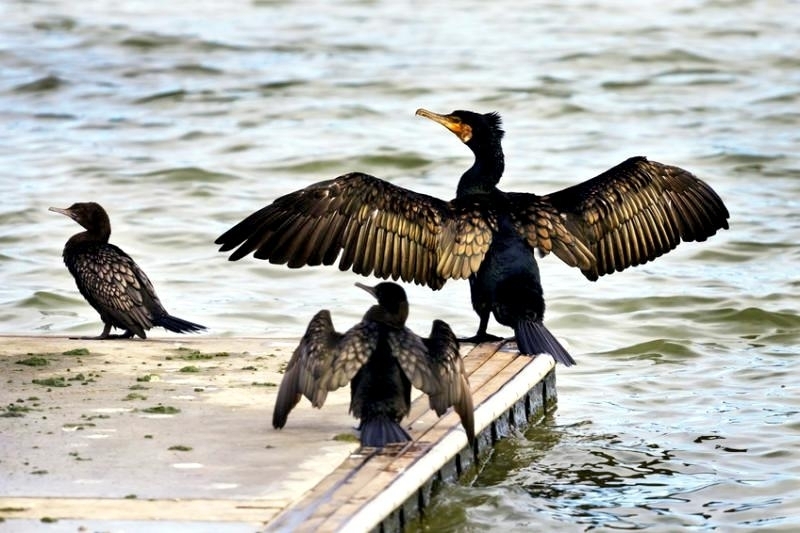 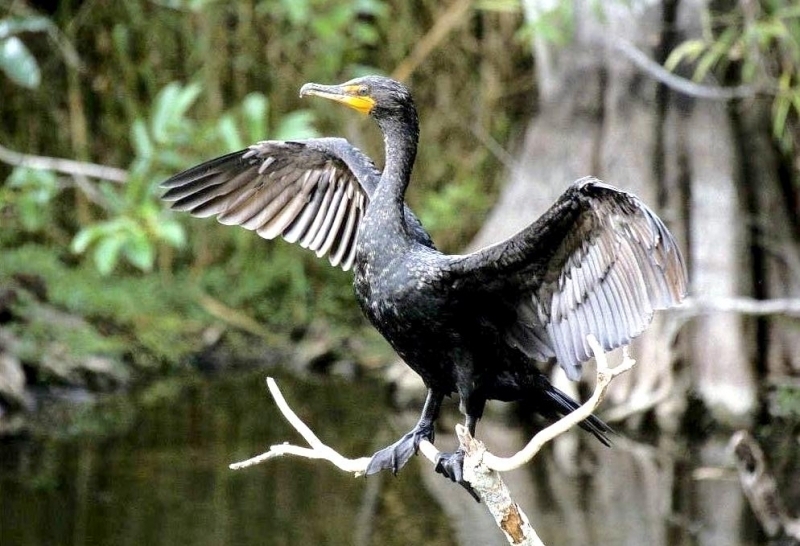 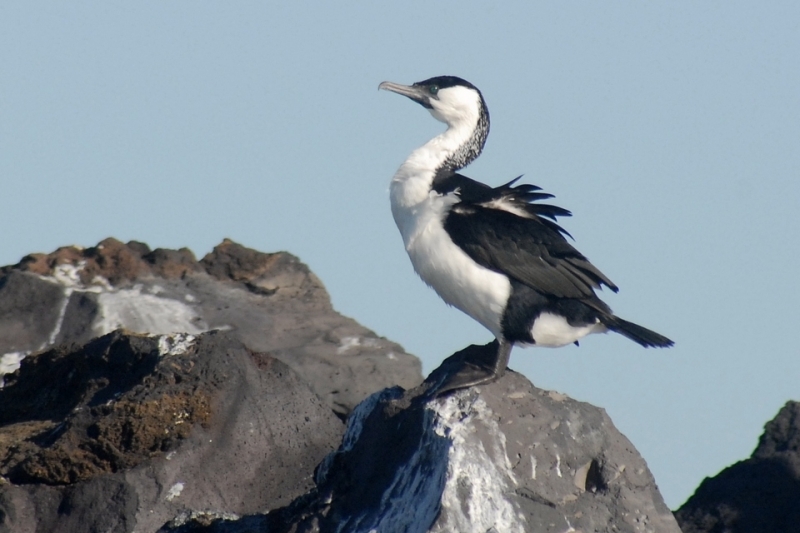 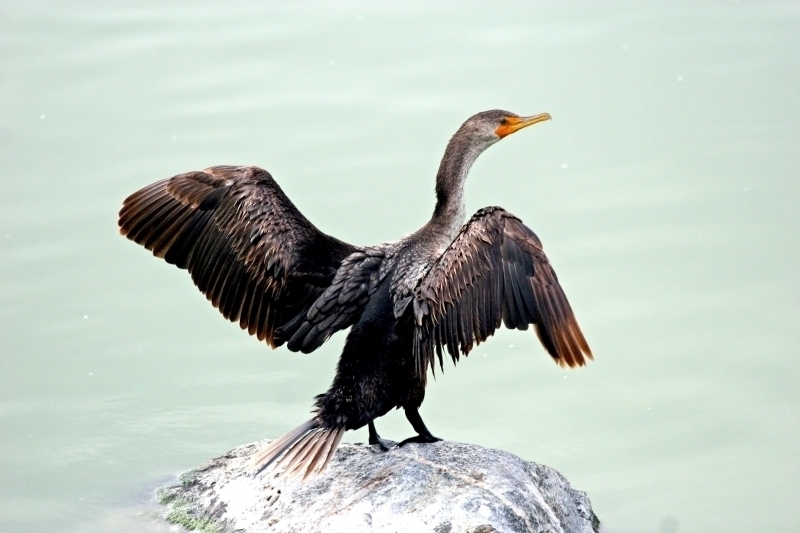 Cormorants are often seen perching on a rock or jetty with their wings outstretched. 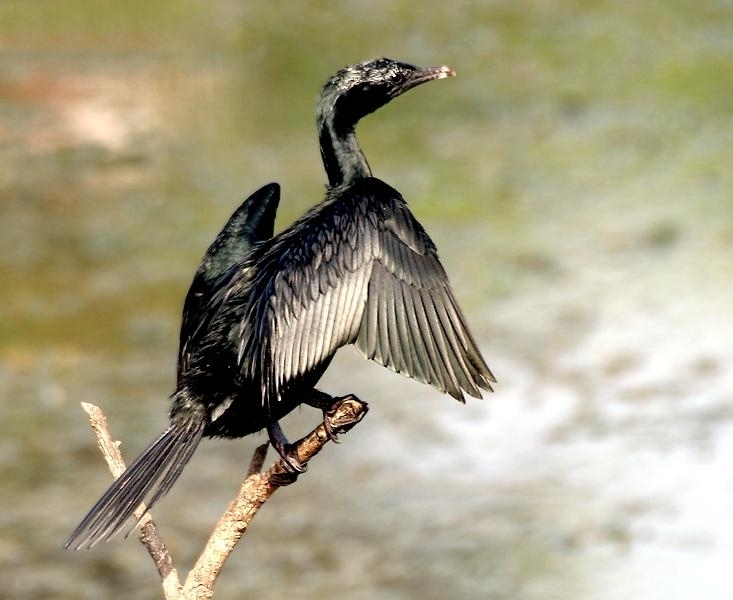 It is often assumed that a bird in this posture is drying its wings because they are not well waterproofed. 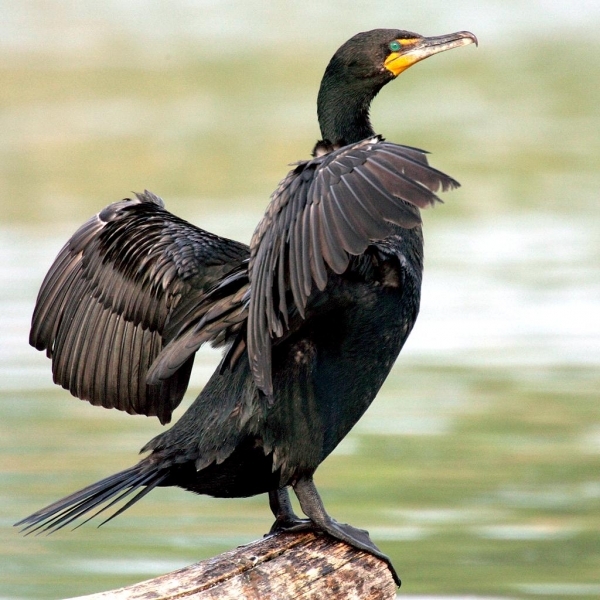 However, this would be surprising in a bird which spends so much time in the water and it can be seen holding its wings open in the pouring rain! 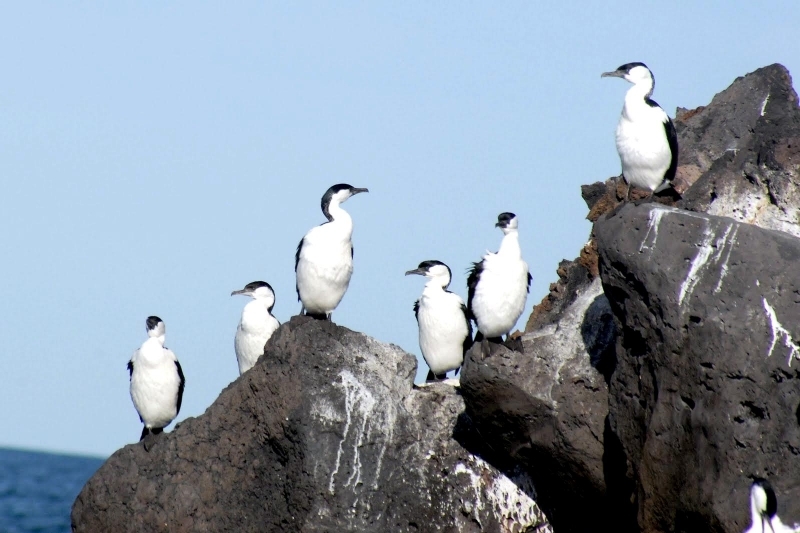 A more likely explanation for this habit is that it keeps a group of birds spaced out. 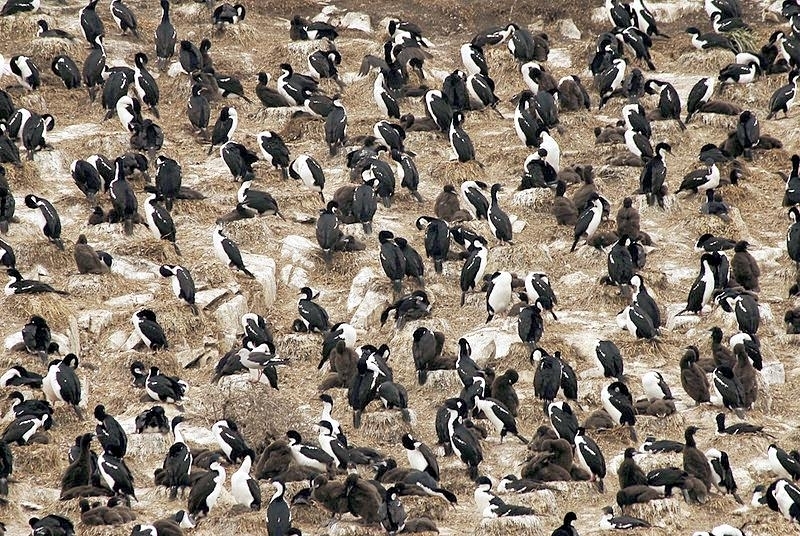 When a bird lands, it extends its wings so that the birds nearby shift away; when it folds its wings the line of birds is well-spaced with a wingspan between each one. 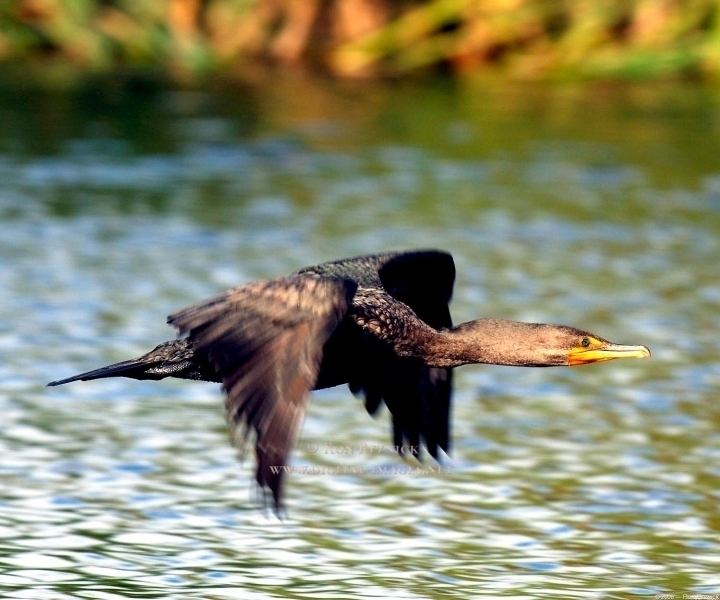 Being spaced out is also an advantage when taking off in a hurry. 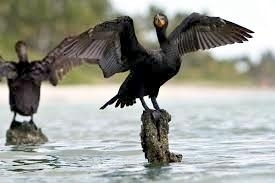 Cormorants are strong fliers, flying rather like a goose, with neck stretched out, head held up and rapid wing beats. 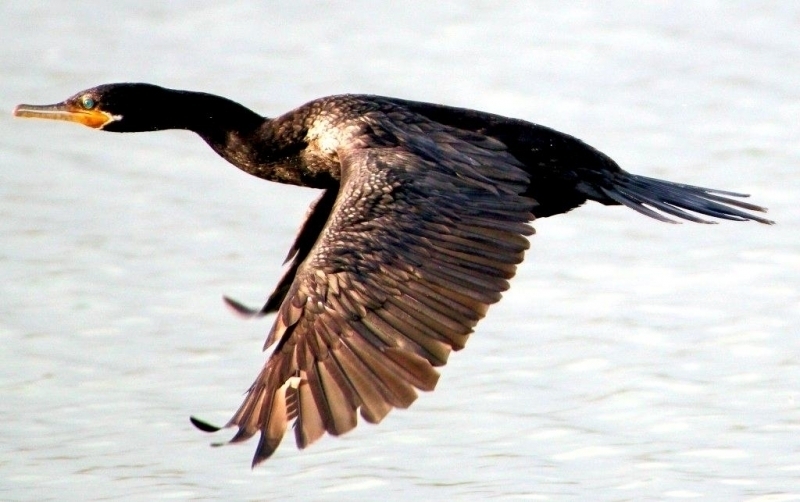 They can soar in air currents, but usually fly low over the water. 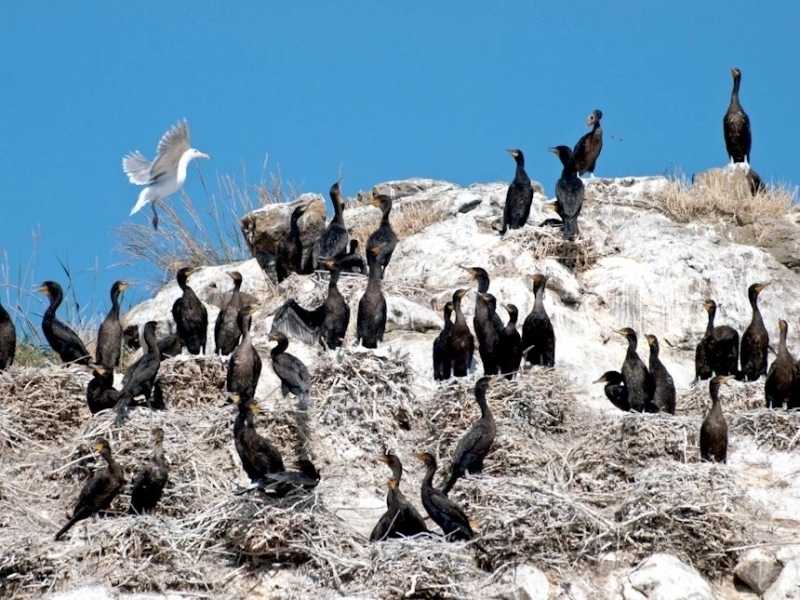 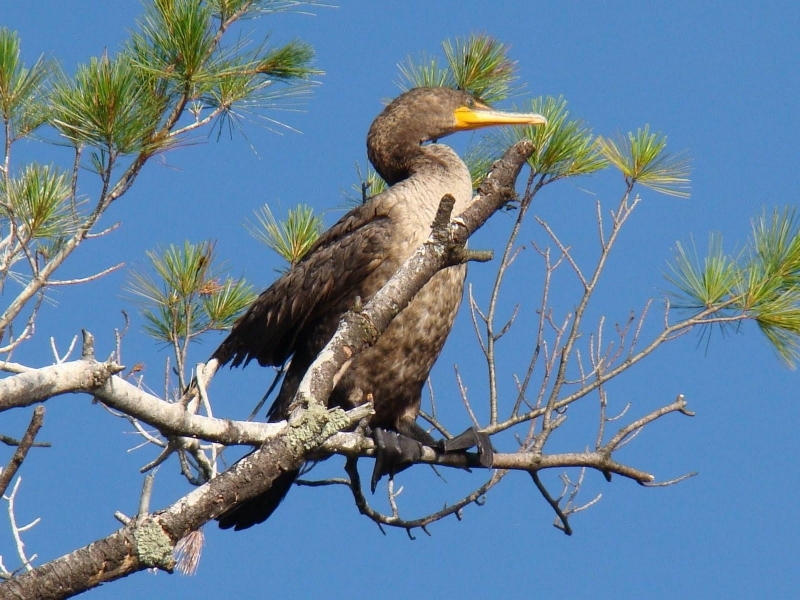 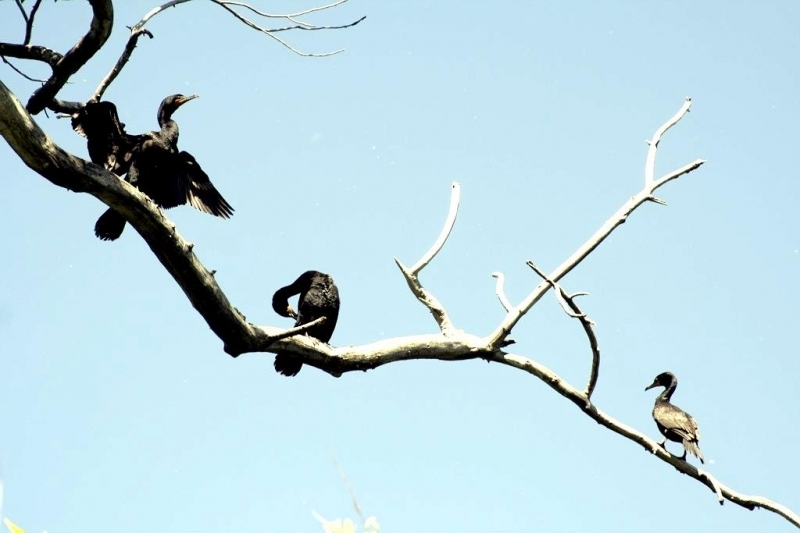 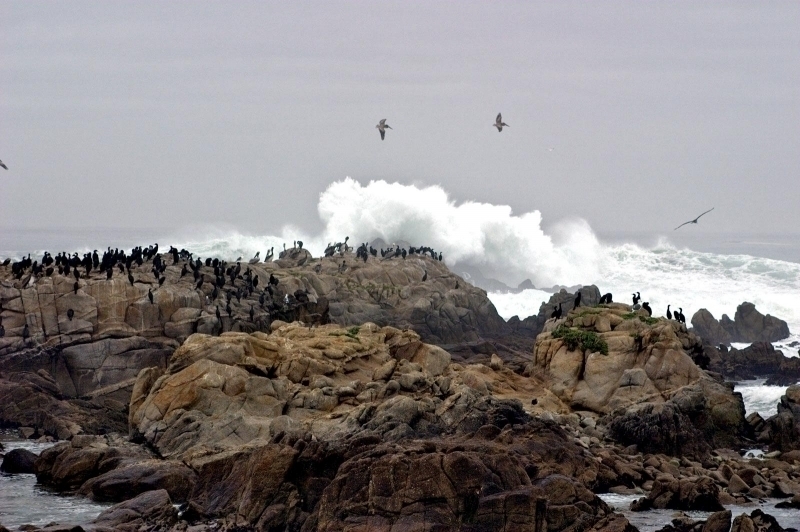 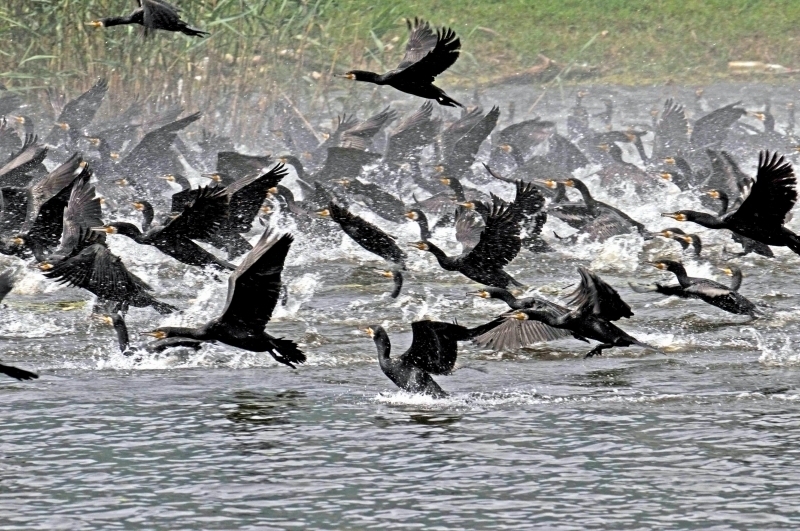 Cormorants nest in colonies, sometimes numbering thousands of birds. 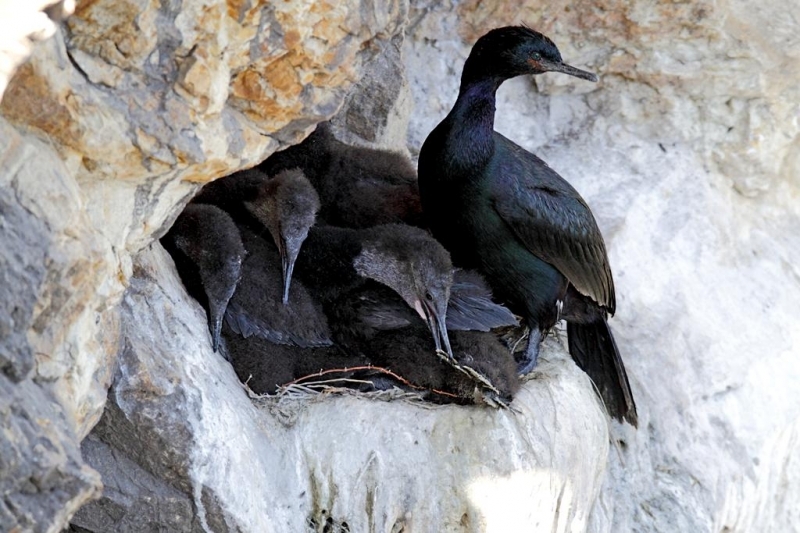 The nests are usually built on rocky cliffs, rocky islets or sometimes by rivers and lakes, even in trees. 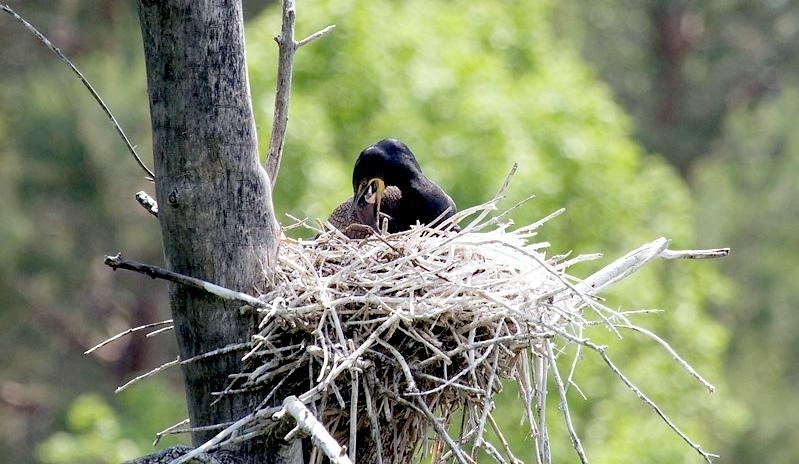 The nest is large and bowl-shaped, built of twigs, grasses, seaweed or reeds and becomes plastered with the birds’ droppings. 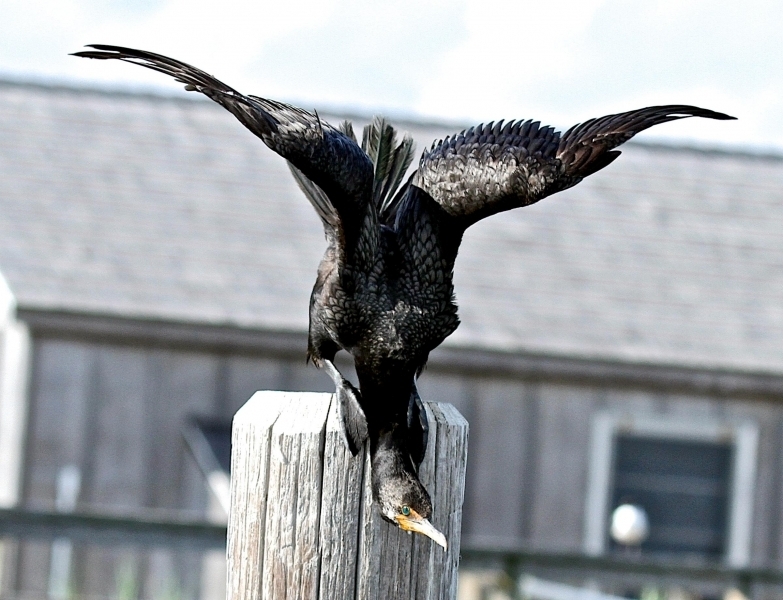 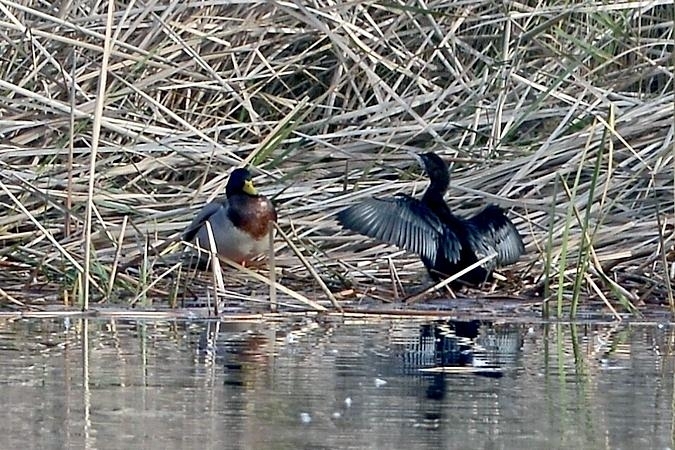 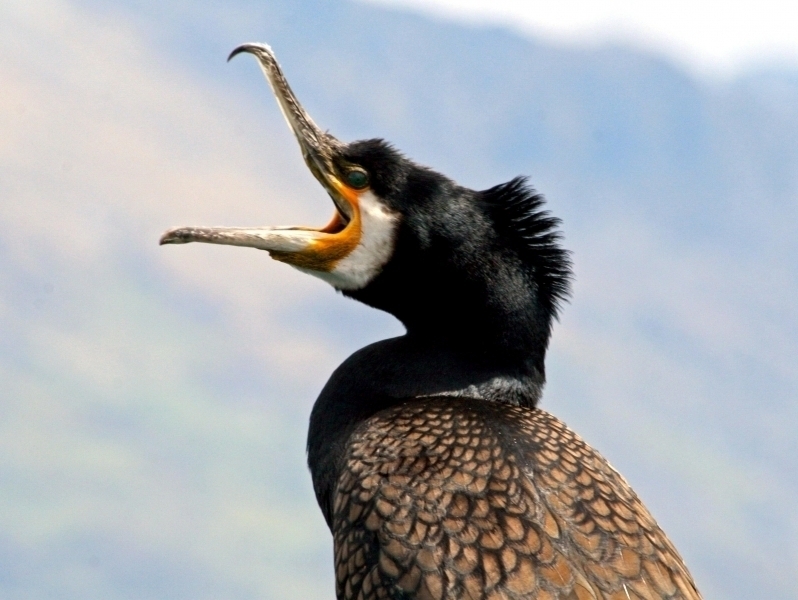 During courtship, Cormorants wave their long necks about and the female may bend her neck right over her back. 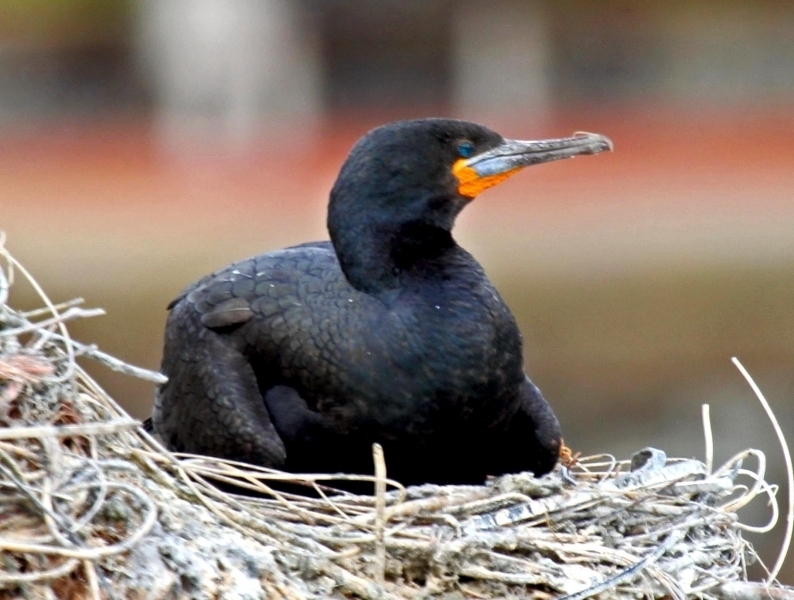 Females lay 2-4 eggs which are incubated by both parents for about a month. 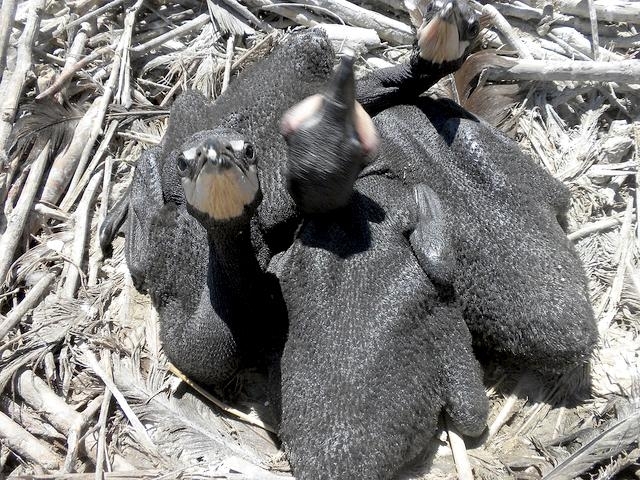 The newly-hatched young are naked and have skins like black leather but later grow a curly, dark grey down. 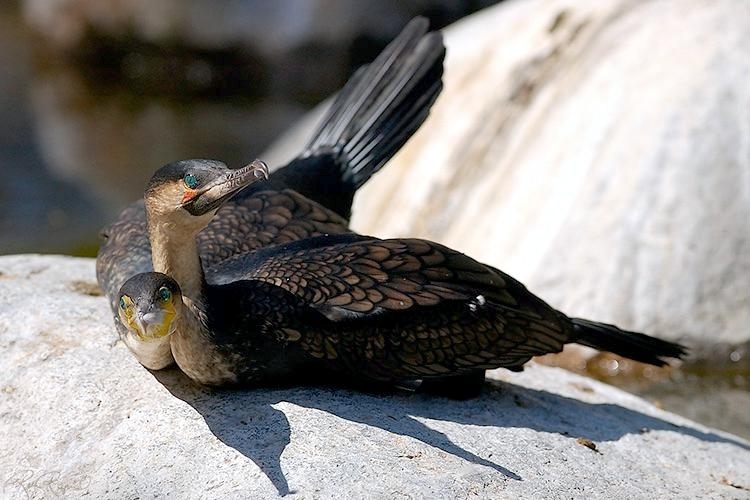 They are fed once a day by each parent with regurgitated fish; the chicks take this by pushing their heads down their parent’s gullet. 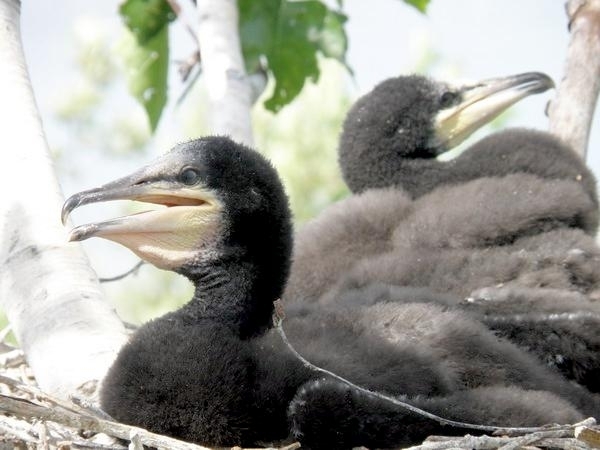 The chicks leave the nest and can fly in 5-8 weeks. 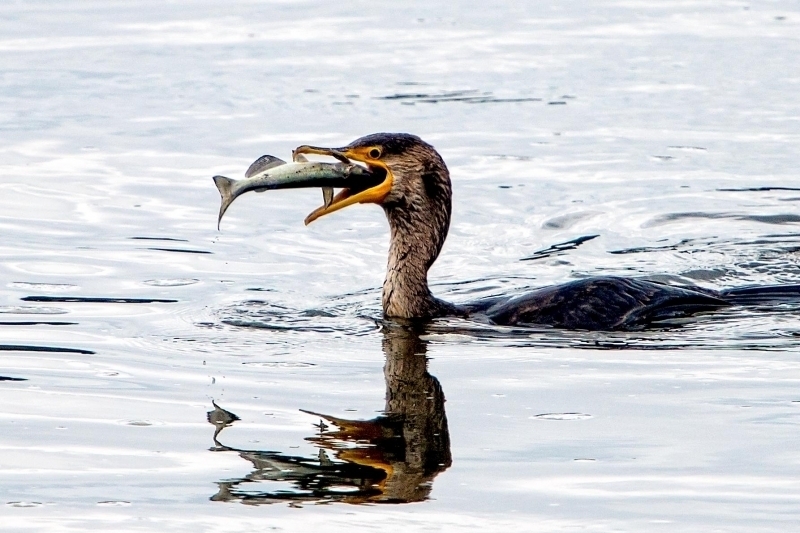 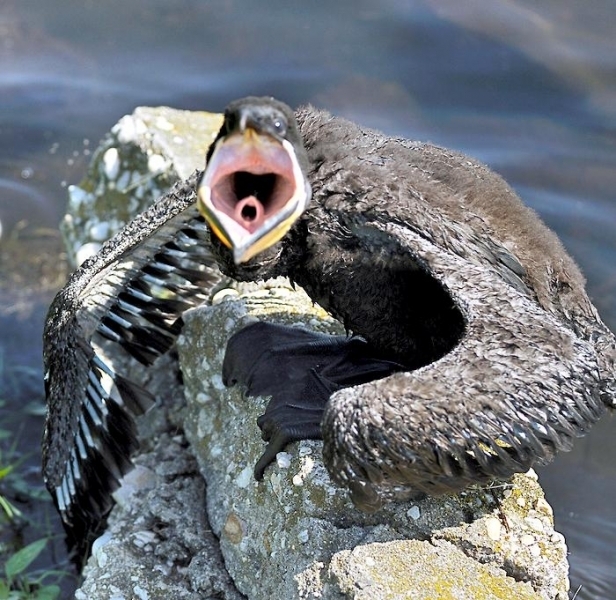 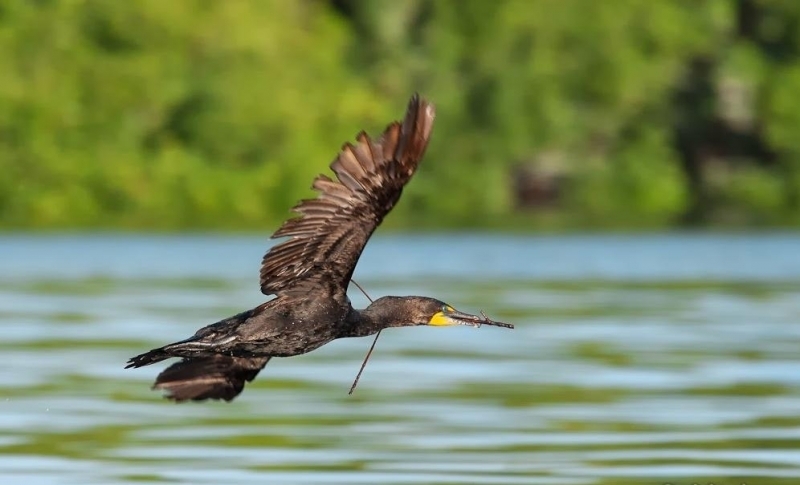 Cormorants have sometimes been persecuted by fishermen because of the belief that they eat huge quantities of fish, especially in rivers where they were supposed to prefer young salmon & trout. 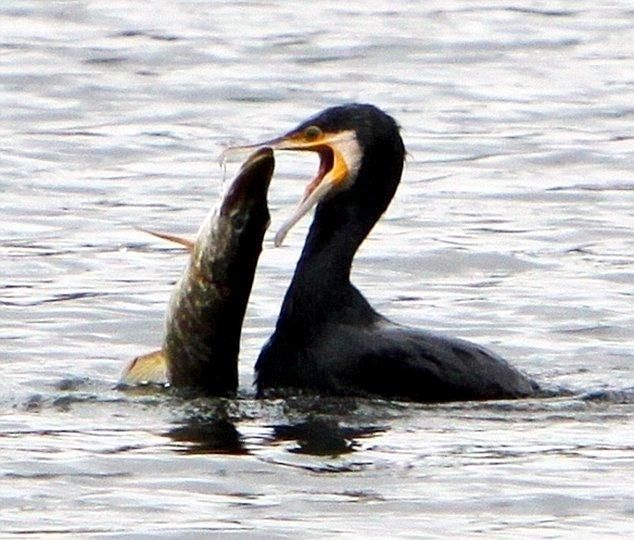 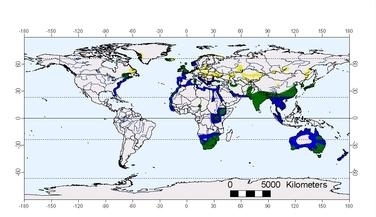 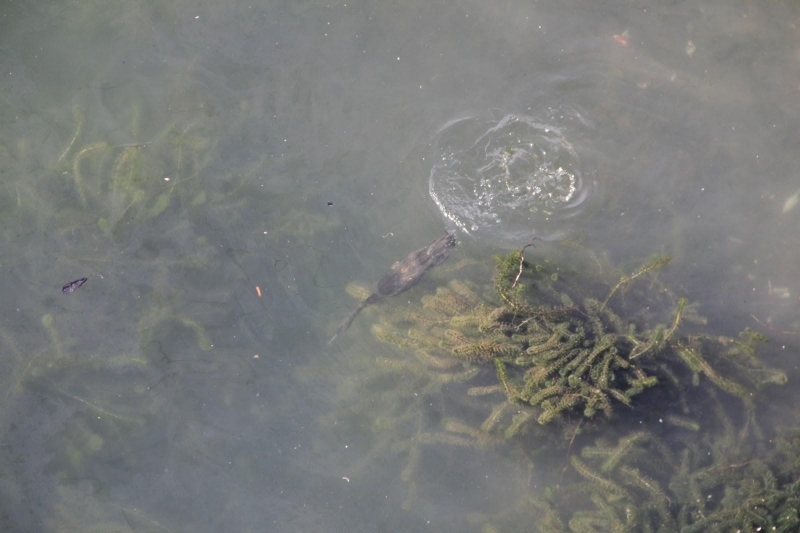 However, research has shown that Cormorants seem to favor flat fish & eels, taking only small amounts of the more salable fish. 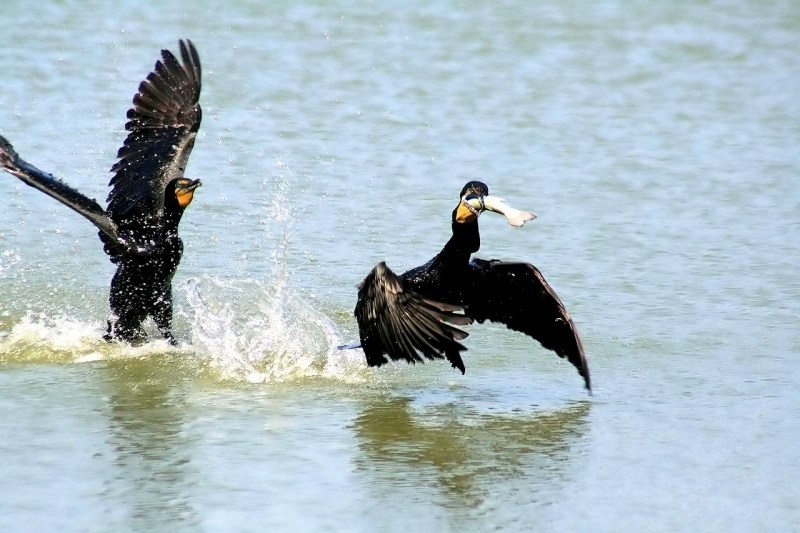 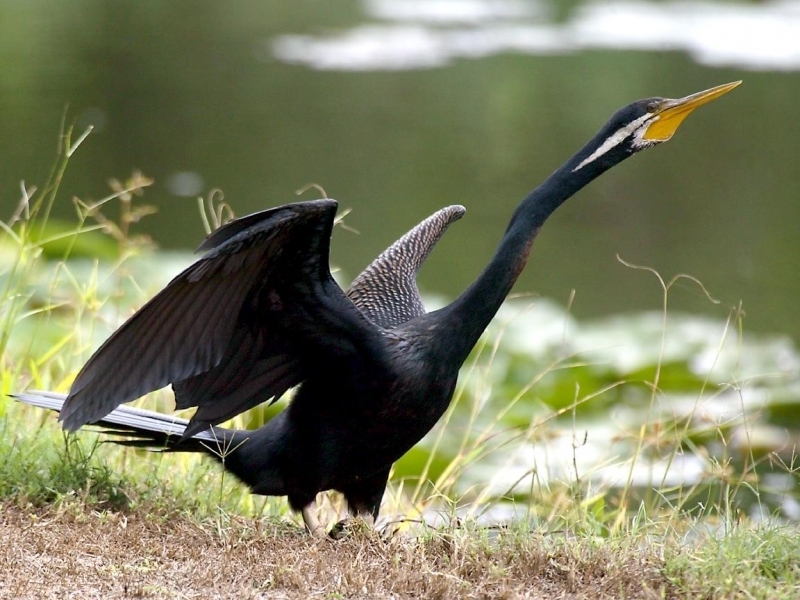 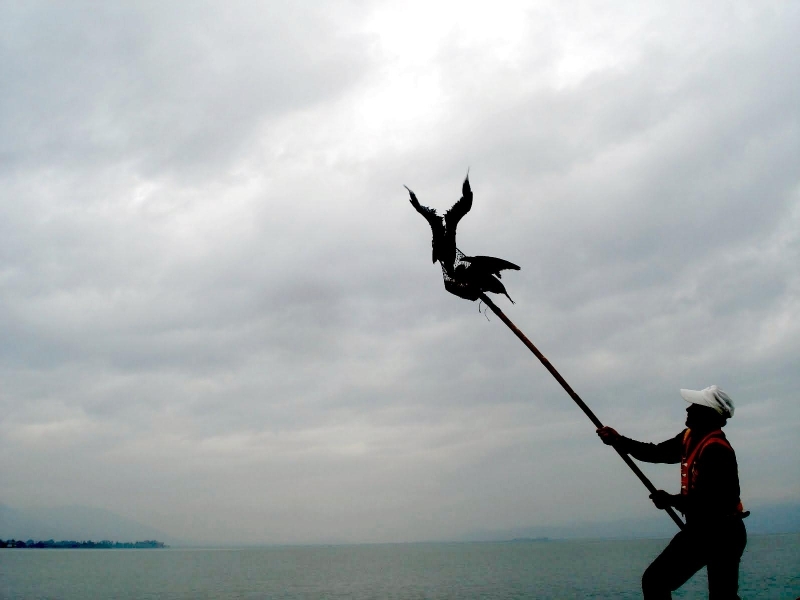 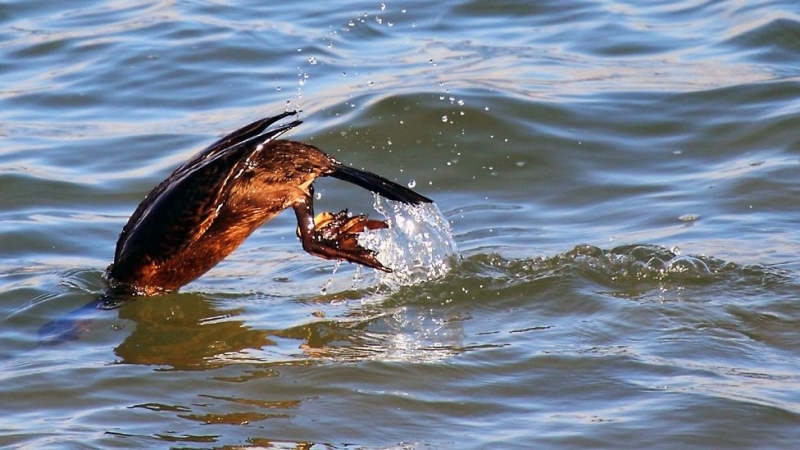 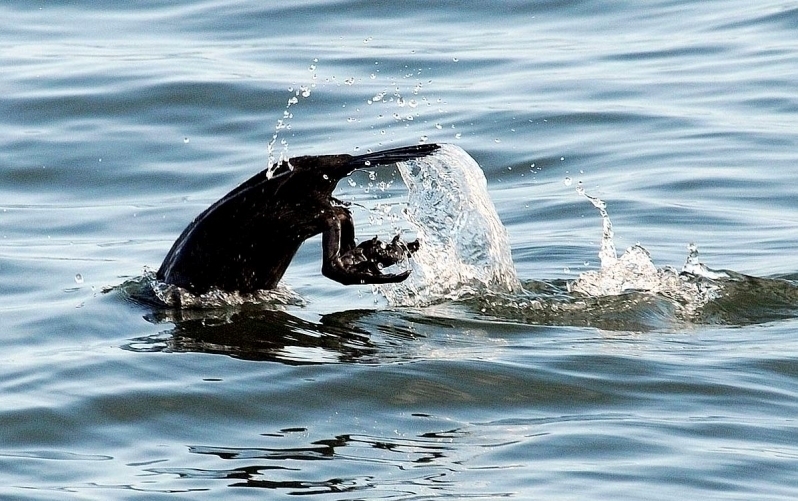 In the Far East, some fishermen make use of the Cormorant’s expertise by training it to catch fish for them. 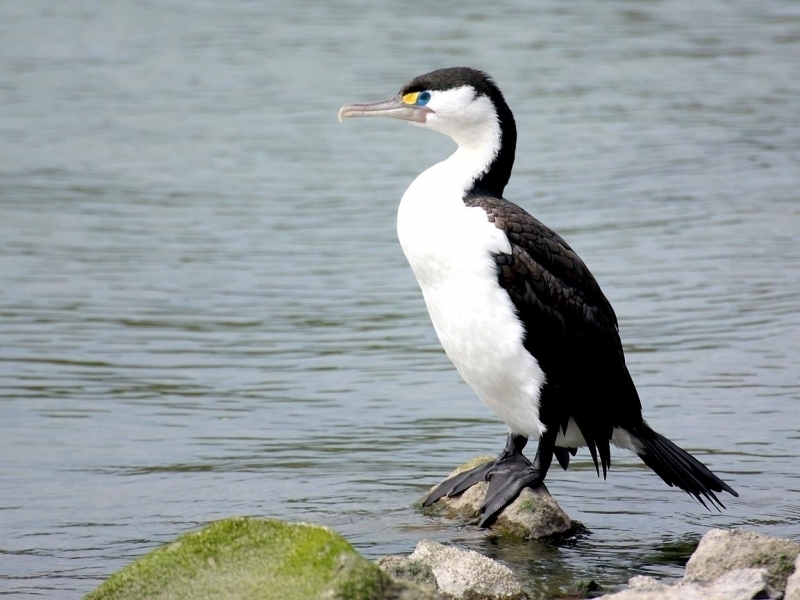 A collar & lead is attached to the bird’s neck and the collar is just tight enough to prevent the Cormorant from swallowing a captured fish. 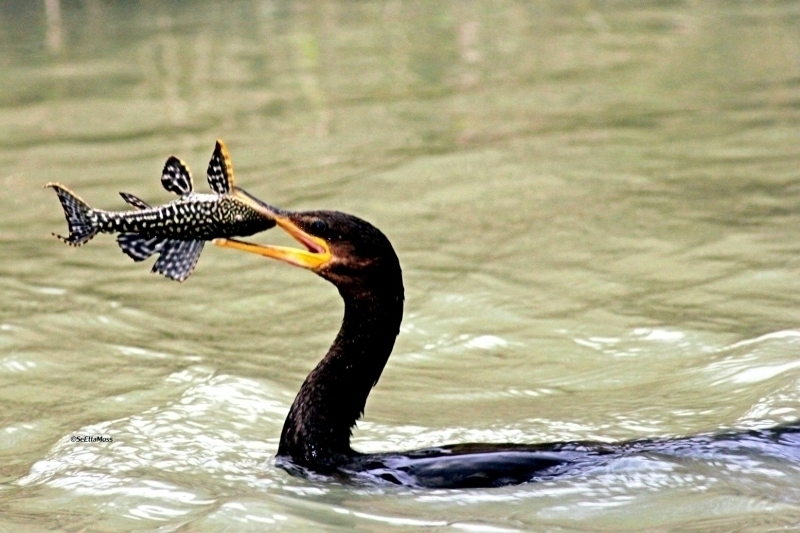 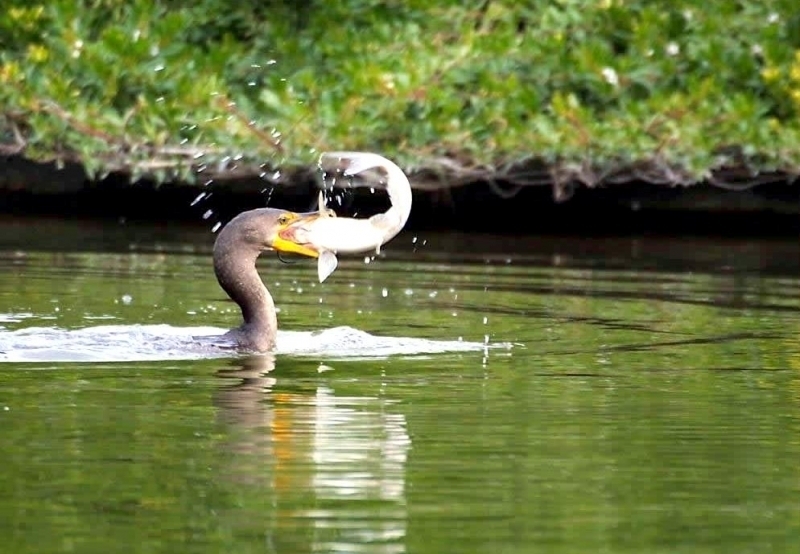 The fisherman retrieves the fish from the bird’s beak, only loosening its collar now and then to allow it to swallow a fish. 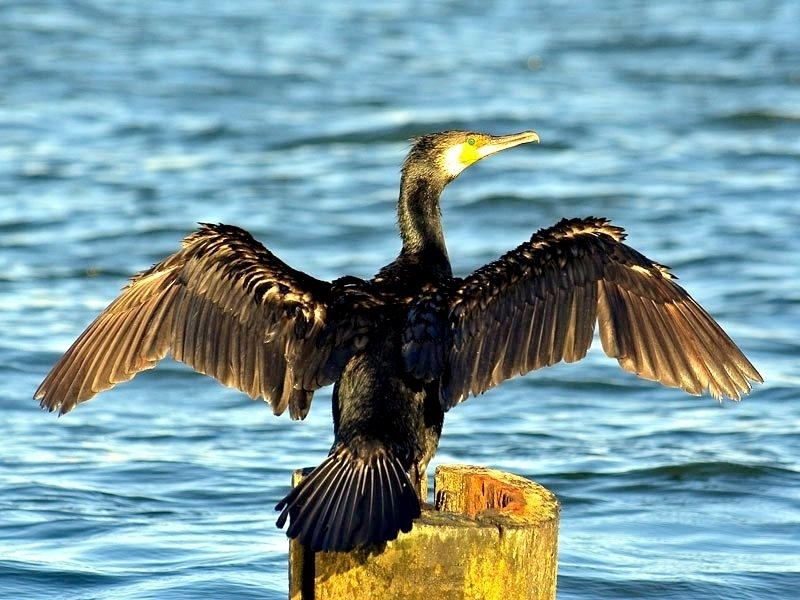 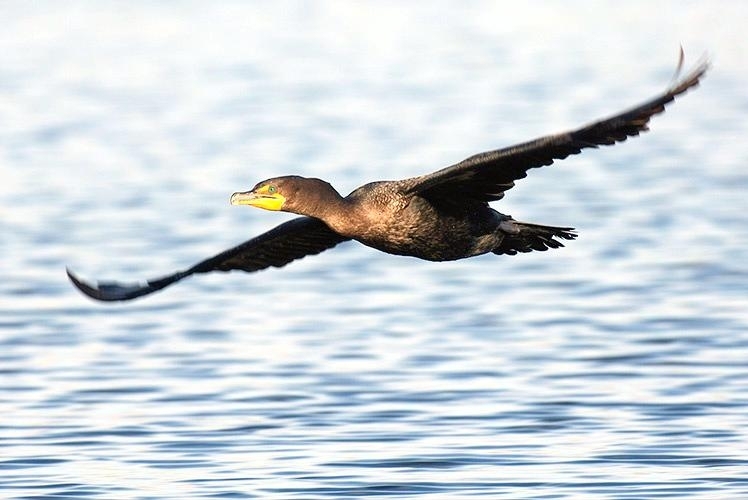 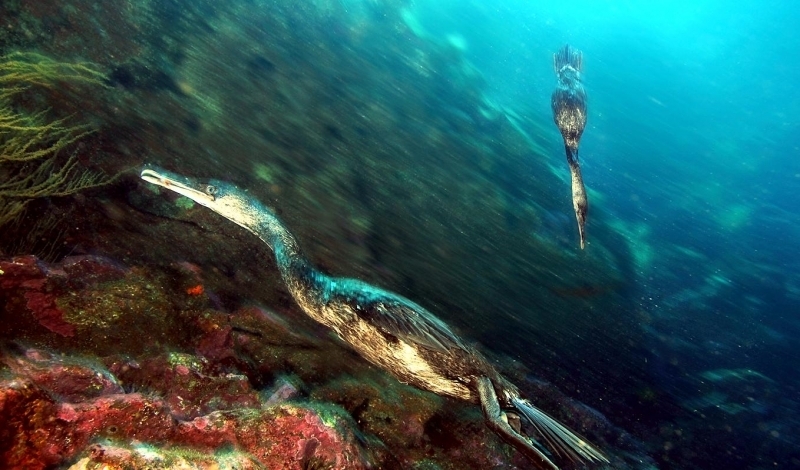 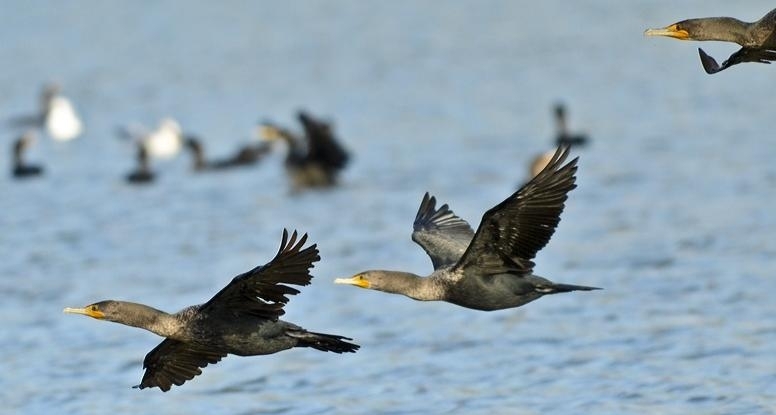 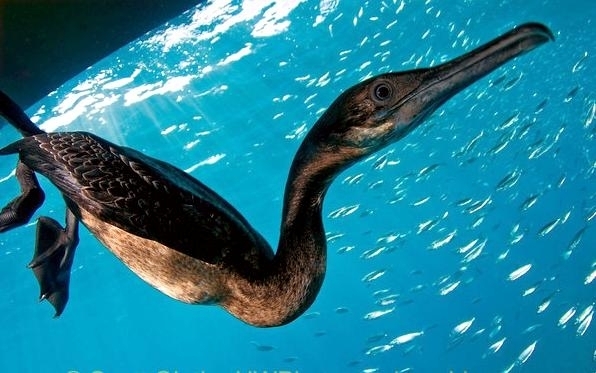 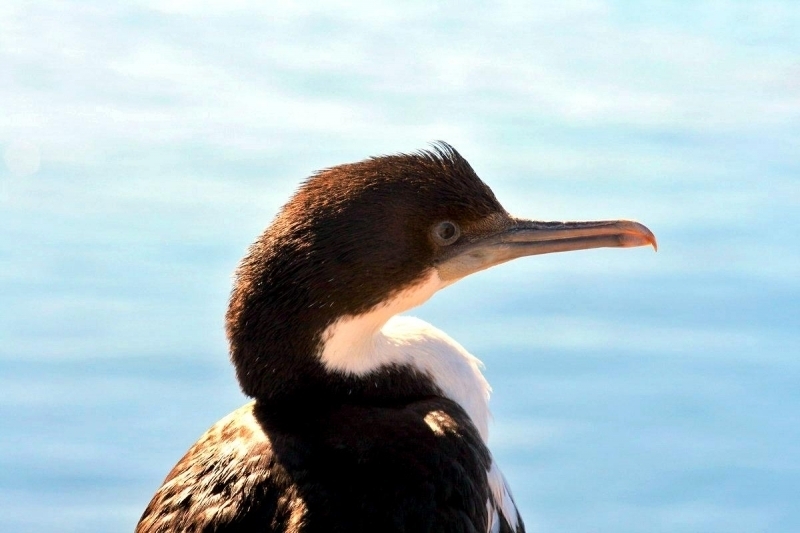 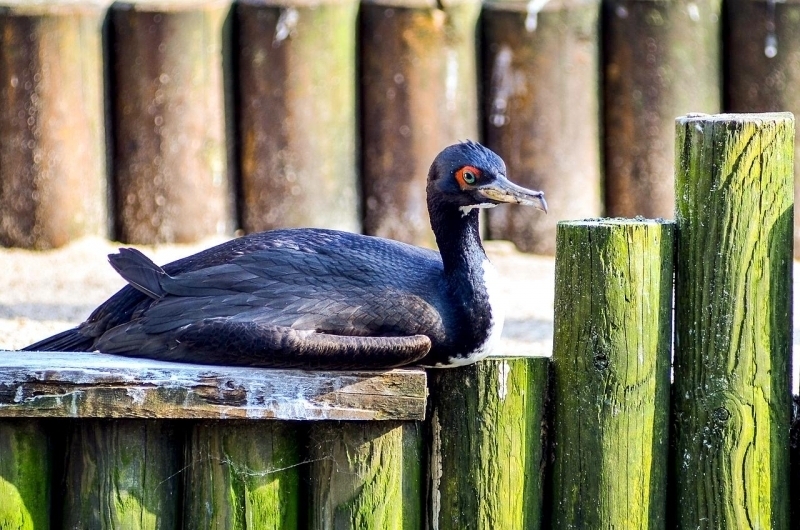 As with many seabirds, Cormorants are affected by oil pollution, caused by shipwrecks or by ships which discharge their oil at sea illegally. 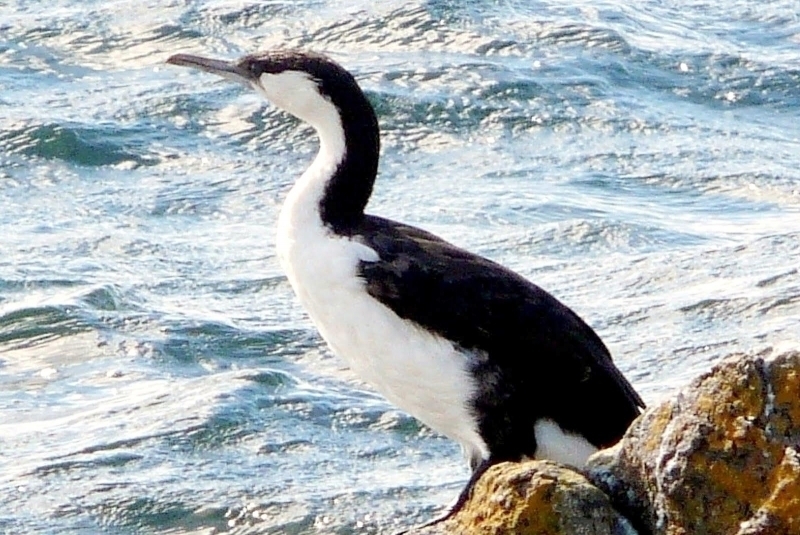 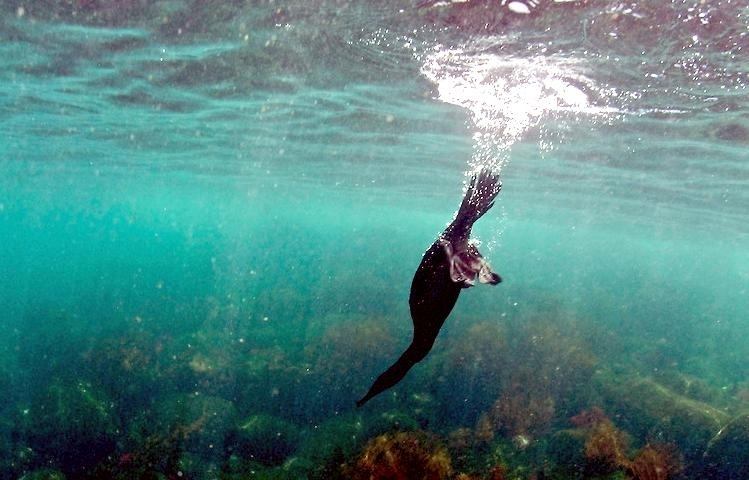 Diving birds such as Guillemots, Razorbills and Puffins have been most seriously affected by oil pollution, but Cormorants have also suffered when fishing in the location of an oil slick. 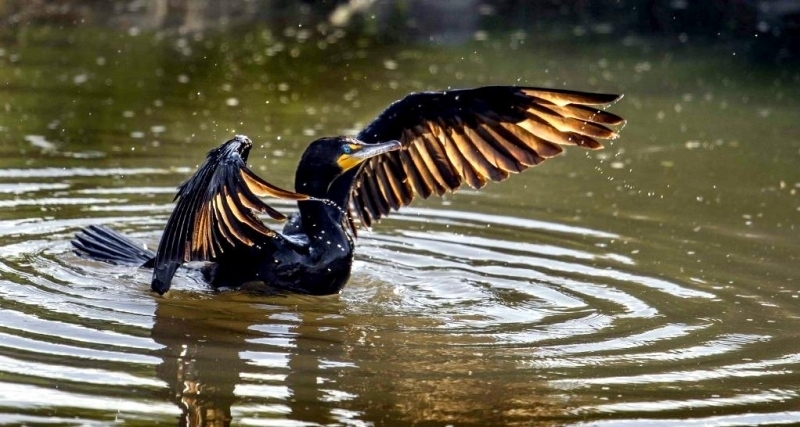 Oil clogs their feathers, they are unable to fly and swim and as a result, they drown and may also die of poisoning if they swallow oil.